All these adapters use a set screw to lock the collar to the shaft. Fits 1.5mm motor/gearbox shafts. Mounts GWS HD and other props with 4mm bore perfectly. Locks on with set screw. Socket head fastener & aluminum washer holds prop onto 4mm boss. Requires (not included) .89mm wrench. 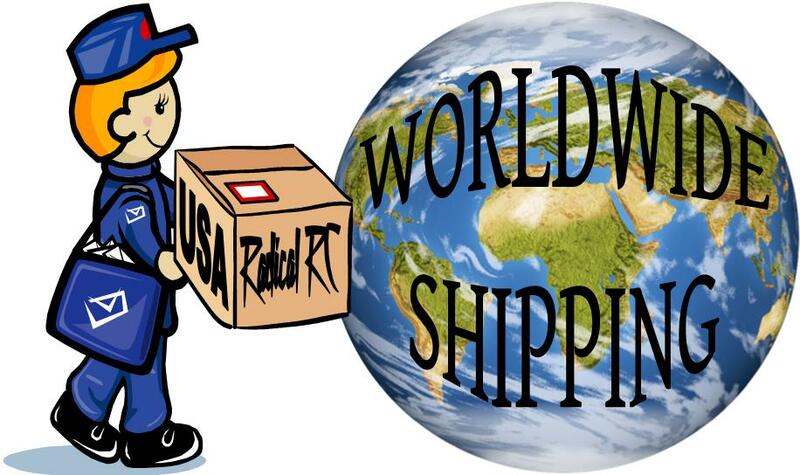 If you don't have one, order part number RRCLWHK below. Allows slip on and bolt fitting of GWS smaller Hyper Drive props such as the 3-2 and 3-3 props. Please note, in general we reccomend our internal collets for this purpose as lengthening 1.5mm shafts makes bent motor/gearbox shafts more likely. Fits 1.5mm(0.06") motor shafts and has 2mm prop shaft. The 2mm(0.08") shaft fits into a black plastic collar to adapt to 4mm(0.16") bore props. Other sizes can easily be adapted. Allows you to have a prop adaptor for motors like the: GWS 50XC, GWS IPS Direct, Feigao 12mm, Medusa 12mm, AON 12mm, GWS EDF Fan Motors and Graupner 150. Please note motor (1.5mm shaft) and prop are for illustration only and not included. The correct hex wrenches are now included with this product. Fits 1.5mm (0.06") motor shafts and has 1.5mm "slip fit" prop shaft (measures 1.4mm). Allows you to slip on the GWS 3-2 and 3-3 props and secure with nut and washer included. This part fits many motors such as the: GWS 50XC, GWS IPS Direct, Feigao 12mm, Medusa 12mm, AON 12mm, GWS EDF Fan Motors and Graupner 150. Please note motor (1.5mm shaft) and prop are for illustration only. Now comes with correct hex key. Hex wrench that is included with RRCPA1.5-2-4 prop adaptor. If you obtained one of the 1.5mm set screw type prop adapters elsewhere but can't get it tight due to the poor wrench, here is the good wrench we include with ours. allso required to mount the RRCPASS15 prop adapter. Fits 2mm motor/gearbox shaft, locking on with set screw. Screw & aluminum washer holds prop onto boss style shaft with steps for 3, 4 & 5.5mm bore props. Fits 2mm motor/gearbox shaft, locking on with set screw. 4-40 aluminum bullet nut holds prop onto boss style shaft with steps for 3, 4 & 5.5mm bore props. Short Prop Adaptor for 2.0mm (0.8") motor or gearbox shafts. Has 6mm (0.24") prop shaft outside diameter. Prop secured to shaft with set screw and washer. SS GWS Prop Adaptor for Speed 280 and 370. 2.0mm Motor Shaft. Fits 2.3mm motor/gearbox shaft, locking on with set screw. 4-40 x 1/4" long socket head fastener and aluminum washer hold prop onto 6mm od 5/16" long boss. Fits 2.3 (typical S400) motor shafts. Locks onto shaft with set screw. Prop mounts on 3/16" (5mm) shaft. 5mm bullet nut. 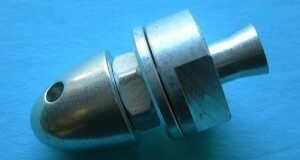 Short Prop Adaptor for 2.3mm (0.9") motor or gearbox shafts. Has 6mm (0.24") prop shaft outside diameter. Prop secured to shaft with set screw and washer. Long Prop Adaptor for 2.3mm (0.9") motor or gearbox shafts. Has 6mm (0.24") prop shaft outside diameter. Prop secured to shaft with set screw and washer. GWS Stainless Prop Adaptor for Speed 380 and 400. 2.30 mm Motor Shaft. Prop Adaptor for 3.0mm motor or gearbox shafts. Adapter secures to your shaft with a set screw. Prop mounting shaft diameter is 6mm (.235"). Fits 3mm motor/gearbox shaft, locking on with screws. Prop mounts to 3/16" (5mm) diameter shaft. 5mm bullet nut. Prop Adaptor for 3.2mm motor or gearbox shafts. Adapter secures to your shaft with a set screw. Prop mounting shaft diameter is 6mm (.235"). Shaft Length is 27mm. Long Prop Adaptor for 3.2mm (0.13") motor or gearbox shafts. Has 6mm (0.24") prop shaft outside diameter. Prop secured to shaft with set screw and washer. Short Prop Adaptor for 3.2mm (0.13") motor or gearbox shafts. Has 6mm (0.24") prop shaft outside diameter. Prop secured to shaft with set screw and washer. Fits 3.2 (1/8") motor/gearbox shafts. Locks onto shaft with set screw. Prop mounts on 1/4" shaft. 1/4-28 bullet nut. Long Prop Adaptor for 4.0mm motor or gearbox shafts. Has 6mm (0.24") prop shaft outside diameter. Prop adapter is secured to shaft with set screw. Prop Adaptor for 4.0mm motor or gearbox shafts. Adapter secures to your shaft with a set screw. Prop mounting shaft diameter is 6mm (.235"). Short Prop Adaptor for 4mm (0.16") motor or gearbox shafts. 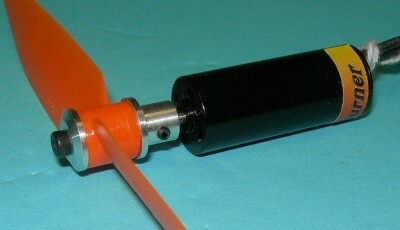 Has 6mm (0.24") prop shaft. Prop secured to shaft with set screw and washer. Long Prop Adaptor for 5.0mm motor or gearbox shafts. Has 6mm (0.24") prop shaft outside diameter. Prop adapter is secured to shaft with set screw. Fits 5mm motor/gearbox shaft, locking on with set screw. Prop mounts on 8mm shaft. 8mm bullet nut. Fits 5mm shaft, Prop shaft is 8mm od and 22mm long. comes with both hex nut and jam type bullet nut. Backplate is cut for wrench.